LEHIGH VALLEY, Pa. — Prudential Patt-White, Lehigh Valley’s largest residential real estate company, will be officially changing their name to Berkshire Hathaway HomeServices Fox & Roach Realtors at a kickoff party and open house 3:30-6:30 p.m. Tuesday, Nov. 12, at the company’s Palmer Township office. 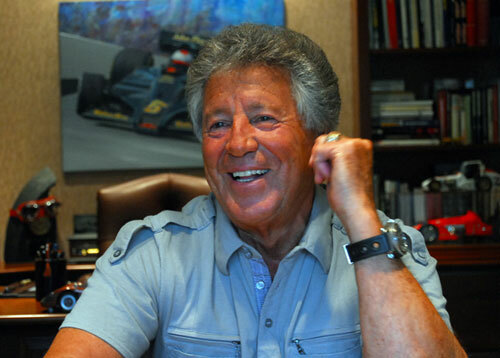 Photo shows Mario Andretti during an interview in Nazareth, PA before the 100th Indy 500. To help celebrate the name change, racing legend, Mario Andretti, whose daughter, Barbra, is an agent in the office, will be on hand to sign autographs for fans. There is no cost of admission to the event and Andretti will sign autographs free of charge with donations being accepted for The Fund to Benefit Children & Youth. Video shows Mario Andretti speaking about his life. Paul Newman narrates. Mario Andretti is a world champion NASCAR driver who is one of the most successful Americans in the history of the sport. He is one of only two drivers to win races in Formula One, IndyCar, World Sportscar Championship and NASCAR. Sports Speakers 360 is a booking agent for motivational sports speakers. If you would like to book athletes like Mario Andretti for a speaking engagement, autograph signing, appearance, endorsement, charity fundraiser or corporate event, contact our booking agent for appearance and speaker fees or call 1.855.303.5450.